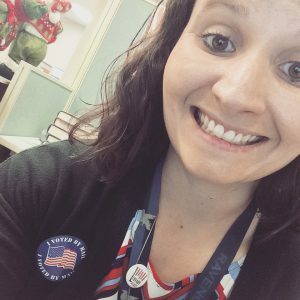 Did you know that you can pick up voter registration forms and applications for advance voting ballots here at the library? The elections are over but the forms are available all year round. Just ask at the front desk. I do not follow politics very closely but I know that it is important to vote. No matter who you are voting for it is your right and a way to help serve your country. Michelle Obama, former First Lady of the United States, in her recent best selling book gives us a peek into her life in and out of the White House. One of my favorite parts was that she focused on herself and her family rather than politics. First line: When I was a kid, my aspirations were simple. 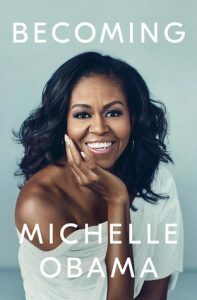 Summary: In her memoir, former First Lady Michelle Obama tells her story from her childhood in the south side of Chicago to her years living in the White House. It is filled with stories of her family, career, and her life in the public eye. Highlights: I absolutely loved this. The cover is beautiful. Her story is inspirational. Other reviewers have stated that it felt like having a conversation with a close friend. I felt the same way. I listened to the audiobook version where Michelle reads it herself. She is very open about her life. I enjoyed hearing her stories of her family life in Chicago. I learned so much about her inside these pages. I knew very little about her. I do not follow a lot of politics. That was not my motivation behind reading this. I genuinely just wanted to hear her story. I am awed by her life. She grew up in an environment that is completely foreign to me. She is an intelligent and driven woman. It really shows that you can go from very poor beginnings to becoming one of the most recognizable women in the world. Some of my favorite parts were her years in the White House. Upon one of their first visits to the Presidential home the Bush sisters showed them around and pointed out the fun parts of the mansion. As part of her role as First Lady she takes on several causes to support. She discusses her goals to help children around the country. The initiative to bring healthier meals to schools started with her own child. Michelle ended up starting a vegetable garden on the lawn of the White House. Local school children came in to help plant and take care of it. No matter which side of the political universe you are on this book is about a woman. A woman who set goals for herself and achieved them. FYI: Listen to the audiobook. It is 19 hours but it is worth it. We do not have a hard copy at the moment but you can find it on Sunflower eLibrary and RBDigital. But you also need to see the pictures so grab a copy of the book as well. If you enjoyed this, check out Sisters First by Barbara Bush and Jenna Bush Hager.